There are four ways to deliver a speech: reciting it from memory, learning it by heart, using notes for reference, and reading it from a script word for word. The method you should use will depend on the type of speaking engagement and the personal circumstances you find yourself in. Memorizing your speech is rarely a good idea because the artificiality of it makes your delivery sound stilted. You may risk sounding monotonous when the natural inflection of your voice disappears. Also, it’s not a guarantee that you’ll deliver a seamless presentation because your focus is shifted from getting the message across to getting the words right. Learning your speech by heart and trying to wing it without notes can work. However, it can be risky because when you lose your train of thought, you’ll have nothing to rely on to get you back on track. The best method is to use notes because at least you have something to fall back on when you lose your footing. It can also help you transition from one idea to the next. While learning all this is good, we’re not really here to talk about the three ways of delivering a presentation. Instead, we’re here to understand the fourth: reading directly from a script. Script reading is a practice that is highly discouraged, unless you’re a person of politics who needs to deliver a speech exactly as it’s written. If you’re a student delivering a report or a business executive making a pitch, there’s no excuse for you to read from your notes at all. This is a basic public speaking convention that you should know by default. A written speech rarely translates to an oral discussion. We don’t speak the same way as we write. Words that are written for the eye (i.e. grammatical, syntactic, generally well-structured) don’t always sound well to the ears. If you want to sound conversational, you need to write the same way as you talk. A script shifts attention from the audience. Reading from a script requires you to look at your notes, and this shifts your gaze away from the audience and limits your interaction with them. As a result, your delivery loses the personal touch it needs. You’re basically just standing there aloof, with your audience feeling left out. They feel like they’re listening to a monologue rather than taking part in a dialogue in which their opinions matter. Your words and actions are measured and limited. A script limits both your words and actions. You’re not free to use whatever manner of delivery you like because you’re corralled into the four edges of your cheat sheet. Aside from this, reading from a script can add a physical barrier between you and the audience: a lectern. This barrier will only fortify the walls you’ve built, ultimately resulting to a disconnect. For this to work, you need to print your notes in large font and have them written on the top portion of a document so that your eyes don’t have to stray down too far. Every time you pause, look at your notes, and before reciting what you’ve scooped, look at the audience again. Eye contact is crucial in public speaking. When reading from your notes, you don’t have to keep it a secret and act surreptitiously. Just chill out and act natural. Even if you’re reading from a script, you should try to not look like it. When drafting your speech, make sure to use common conversational words that sound natural when spoken. Use informal language; otherwise, you’ll just sound foreign and distant. Be mindful of the natural cadences and rhythms of spontaneous speech, and make sure to apply them throughout your presentation. To improve your vocal variety, you can adjust your facial gestures to match your words. 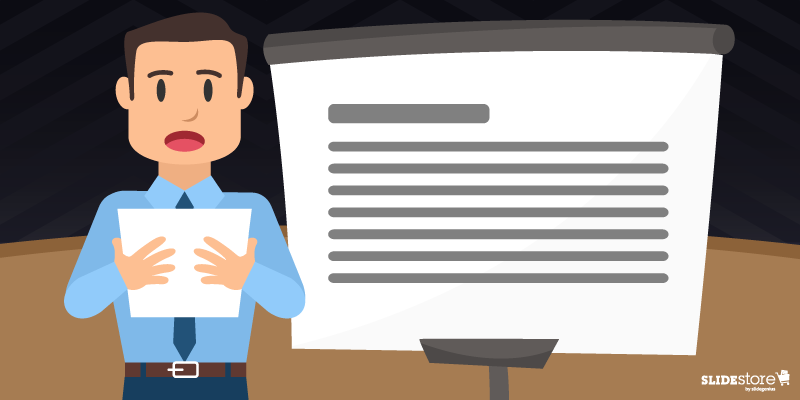 Your PowerPoint presentation is not a script, so don’t treat it as such. Instead, make separate notes that you can use as guide. You can also use the Notes feature in PowerPoint. It has a Presenter’s View that can let you see your notes for a selected slide without the audience seeing them. Just make sure to practice using your script beforehand so that you won’t get lost in the middle of the presentation. Break long blocks of text by using headings, subheadings, line breaks, and pauses. Use signals to help you break down the text and cue you as to where to begin and end, or what to stress and blend. You can even add instructional annotations along the margins to make everything crystal clear. When you’re in a pickle and you have no choice but to read from a script, follow the tips above. However, in any other situation, try to explore other ways of delivering your presentation. Don’t limit yourself to the four edges of a page. Instead, allow your mind to roam free without straying too far from your core message. This is, after all, what being an effective public speaker means.